Pugachev Service is offering BMW i8 with laser headlights and fantastic design that goes beyond your imagination will remind you of a spacecraft. This ultimate machine is available for short and long term rentals at our locations in Miami. The perfect combination of the electric motor and powerful engine developed an outstanding hybrid car for the benefit of the driver. The latest technologies and out of this world look of this vehicle will definitely grab everyone’s attention. This car is just as an exotic as it can get because it is about the technological innovation and stylish appearance. 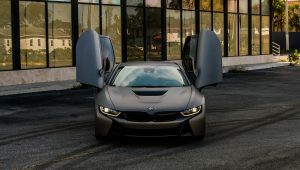 Besides its luxurious look and belligerent exterior lines combined with the scissor doors, German engineers who worked on developing this ultimate sport car with 357 horsepower hybrid powertrain and fuel efficiently well above 30 MPGs. 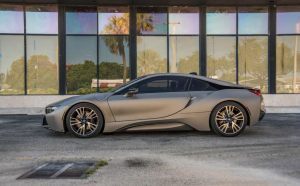 The BMW i8 is all about technological innovation and sophisticated look. 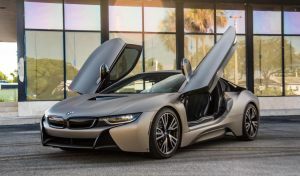 The looks accomplished in this exotic and expensive car are accountable for providing one of the most efficient aerodynamics in its class; therefore, BMW i8 has been on the high demand among car fanatics and professional drivers worldwide. 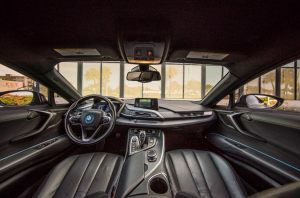 You will spark envy on other drivers while enjoying a truly unbelievable driving experience and will not be able to resist to become emotionally involved with this absolutely mind- blowing vehicle. Our top priority is to provide an outstanding rental process that is simple, convenient, and secure for our clients. We are working to provide you all important information about the vehicle you are going to be driving in order to guarantee an excellent experience on the road during the rental period. 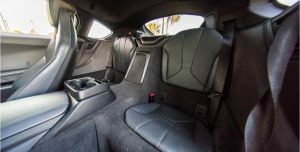 Furthermore, for your comfort Pugachev Service offers airport pick-ups and Chauffeur Service in case you want to be driven around with comfort, class, and style.